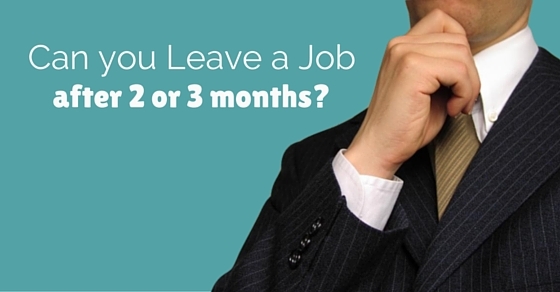 Can you leave a Job after 2 or 3 months? Is it OK to QUIT? Leaving a job before a year is not at all a horrible sin which will render you unemployable further. There are times and circumstances when it is reasonable to quit a job when you see that your offer prospects doesn’t match the actual work. There are several unforeseen reasons, like-your health issues or some relocation in your family. The catch is here: you can do it with a valid and supportive reason. You will have many reasons once you get in the job. Within a couple of months, you will start to feel that the work culture is not fit for you. It is stiff with minimum collaboration and has become more tedious than expected. Simultaneously, you get news about a new position in another organization. Its skill set, pay package and opportunity for advancement attracts you. It is unable for you to decide whether to switch over or not. IT is a matter of career and what best suits you is the only one which will help the company as well. Before we go any further of this discussing, one fact needs to be stressed is that how thoroughly you have assessed your coming opportunity and its comparison with the existing role. How to (Smoothly) Leave a Job After Only a Couple of Months? One of the common advice which we get as a fresher is that it is better if you could stick to your first job for atleast one year. Coming across as an undependable, job hopper at the initial stages of career would not look good. Saying this doesn’t mean that, you need to be in the job even if you are not interested in it. That would turn out to be even more terrible for your career growth. The whole point in the argument is that being stable at a job without hopping too much would make you reliable, independent, trustworthy and a true professional in the eyes of the interviewer or employer. But getting your dream job or landing the job which you like in the first attempt itself may not be possible for everybody. At that time quitting your job will be the only option left for you, rather than getting dragged in a one which doesn’t interest you any further. An offer of your dream job. When you are not interested in your job, then working there for even 1 day may look like 1 week to you. Quitting a job is not that easy if you think about the things that you have to face later on, especially when there is no source of income. As per employment experts, most of the people continue with jobs which don’t interest them but continue with it as it helps them to meet the ends. In this type, though you will not have job satisfaction but you will do it, for the paycheck which you get at the end of the month. Working in a job which doesn’t help you grow or the one which doesn’t fascinate you will not help you in the long run. So it is better to look for another job as job hopping is the only option left for you. Here are 15 tips that help you leave the job within three months of joining a job. However note that before moving in, you should be focused about your future career and take these steps accordingly. 1. Prepare and share a non-work personal contact information. 2. Be active on LinkedIn. 4. List down all possible employers. 5. Speak to your boss in person. 6. Should not be emotional. 10. Avoid being a slacker. 11. Prepare for the exit interview. 12. Go through all legal formalities and documents. 13. Should have an extra source of income. 14. Have faith in yourself. 15. Tie up all the loose ends left. What we prioritize is the salary package, the job title and the notice period, whereas our main areas should be the company work culture and the ratio in which you will be able to fit in that culture, it actually depends how much you value money. In a secure employment, one employee feels that working is more important than a modest increase in salary. You are almost spending half of your life working, and if you current job is making you happy; you cannot load it with a price tag. It’s never worth staying at a job which makes you miserable and restrict you to become a better person. If you are qualified enough to take a jump in your career path, then you should go for it. Because, in this case, even the employer sometimes support to make a switch over for a better placement. But don’t be less attractive to the employers in the long run. Stay in one company for a desired amount of time, and then only can you think of getting a pay hike or a promotion. You cannot discover new oceans unless you have the courage to lose sight of the shore. You think that you do them a favour by completing the last and most important job and foregoing your latest opportunity for the sake of the company, and in return you get a farewell which consist of a one month no salary or they forfeit your leaves or other benefits. Such lousy company policies are imposed when it comes to employee rights. There are two types of bosses: One who will take keen interest in your personal development and delegate appropriately and the other one who will leave you alone. Everyone is allowed to express their views certainly. Think about discussing your weirdness with your boss and make it clear about what you want. Just walking off from the company is not always a solution. A level of maturity and responsibility is always expected. Titles and positions don’t matter much in the resume. Titles are always compared with the size of the company too. Many people have senior title with lack of experience and technical knowledge. So, Focusing on the title is not as useful as focusing on the tool kit you want to build for yourself. The new employer will have a fear that you may do the same thing to them. If you are leaving your present job a bit early, you have indirectly placed a commitment unto you that you will stay on the next job for a pretty long time. You need to be really careful for the next job you take. You cannot afford to accept a hit to your own reputation. So plan wisely as your act may affect you in future. Even if you are in a higher paid job, you can choose something in relation to pay cut only because you were miserable in your current job. It is perfectly OK to change your job regardless of your date of joining and the months you served. If you seek good work culture, good people and good salary in a job, which shall also include good brand name and company location, all may not come under a single package to you. So, you need to maximize the probability of which things you require as best and which things you can forego slightly. Consequences of leaving just after few months will have an impact upon the company as well. The resources of the company in the form of time and money were wasted on you. Plus the area you were into and the role you played, will suffer setbacks. Now the company will have to go into a new hiring process. Large companies may digest it a bit easy but in small companies, the impact may not be easily absorbed. If you are brave to say good-bye, life will reward you with a new “hello”. It is true that making a life change is scary. But scarier than this is regret of not making. So, quit your job, Start a new part time and wait patiently for better and logical opportunities. If you find that you do not like your job, and you are not being able to give your 100% dedication. In this way, you will disappoint both yourself and your company. When you develop a desire to prove yourself and you are not getting ways to or you are being restricted due to job profile or level of management, then you realize that you should stick out of it. You might feel that it is a complete failure and you want to give up, then go for it. You learn from your failure. If not today, then some other day, you will definitely end up quitting. Such a situation built up in your life that you feel even if after no backup plan, you cannot continue with this job. And if ever you continue, you might be setting yourself to follow negative situations in life. If you know that every day you are feeling stressed, unhappy and angry, then continuing to go will be disrespectful to your well being. You will have to disregard your own feelings and get away from normal life. So it is necessary to learn what you like and what you are fit for. Staying in a job you hate will not help. If you stay at a job for a long time, your learning curve becomes negative and you do not feel new and stimulating. Showing impatience in a meaningful work life will lead to quitting immediately. Life is short, work somewhere awesome. If you stay long at a job for a better tomorrow, you won’t get any results, but when you quit within few days of joining, a good company will be forced to figure out what points they had pushed up so hard that you have quitted so quickly. Until you are passionate about the mission of the company, you will not be able to produce best results. By staying at a position you hate the most, you will not benefit the company. Maybe someone best suited in your place might just excel than you. So, do the company a favour and allow the company to appoint someone better in your part. High performing employees, in companies like Proctor and gamble or GE or any other MNC, have come through a wide range of job hopping. There is no rule that you will have to stay in a job that is not teaching you enough. And a person is at will to decide when his job is not right. People, who have self-respect and teamwork instincts and know when to cut their losses, are those who succeed. That is the reason high performers leave bad jobs early. If you are happy and satisfied in your current role, you will not find the grass greener on the other side. But if you are demotivated in your current state, then one short gap in your resume will not be a cause of concern, till you explain the gap with a sound reason. You can ask for a tour in the office when you go for the interview and see with your own eyes, the way the employees work. Meet as many people as possible who work on a daily basis in the said company. Ask people why do they want to work in this company? Doing a company survey will not only make you look seriously interested but also will help you decide if this is the right place for you to work in.